Alexanders of Market Bosworth have been favoured with the instruction to sell a detached barn conversion set in rolling countryside on the outskirts of the most sought after village of Stoke Golding. 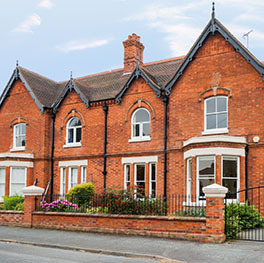 Stoke Golding is conveniently placed for access to Market Bosworth, Hinckley and Leicester and within close proximity to the M1, M69 and A5. This desirable village also benefits from three public houses and a local shop. 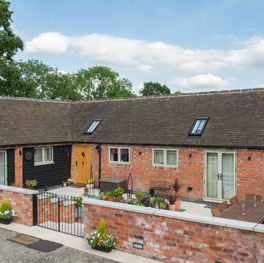 Willow Barn affords stunning bespoke living accommodation with original character features. Sympathetically rebuilt and converted in 2015 by the current owners this two bedroom property is appointed to the highest level throughout to include piped underfloor heating, smart device controllable heating and lighting, CCTV and a fully networked TV system. The property benefits from a gated access with gravel driveway providing ample off road parking for numerous vehicles and an iron gate to an enclosed courtyard area. The courtyard is laid to a mixture of slate and flagstone tiles with lighting, a seating area and access to oak front door into entrance hall. The main living space is accessed off the entrance hall and affords a vaulted ceiling with timber beams. The layout is open plan to include fully fitted contemporary shaker style kitchen, dining space with French doors opening out onto the courtyard and a seating area with wood burning stove. The fully integrated kitchen comprises a range of eye, base and full height units with LED sensored lighting and Quartz work surfaces with upstand. Appliances include two pyrolytic cleaning AEG ovens, four ring AEG induction hob, Electrolux stainless steel extractor fan, Whirlpool microwave, Bosch full sized dishwasher, AEG split fridge freezer and electronic water softener. The entrance hall also provides access through to the master bedroom suite benefitting from a vaulted ceiling, bank of built in wardrobes, French doors leading out to the courtyard and a superb four piece bathroom. The bathroom is fitted to a very high contemporary standard to include a double walk in shower, bath, vanity unit with hidden cistern WC inset and wash hand basin over. The second bedroom is also a double affording countryside views and there is a modern shower room comprising walk in shower, hidden cistern WC and contemporary vanity unit with wash hand basin. Externally the property sits in circa 1/3 acre to include a paddock to the front of the plot with a natural pond and stone walling and timber fencing to its perimeter. Sole selling agent Alexanders advise an internal inspection is essential to appreciate this unique and special property offered to the market with no upward chain.